Rating: 4.7/10. From 13 votes. Rating: 4.3/10. From 84 votes. Rating: 4.2/10. From 17 votes. Rating: 5.4/10. From 37 votes. Summary: The description, specs, photos and user ratings for the Edge Arms Reliant pistol. Rating: 4.5/10. From 16 votes. Rating: 5.5/10. From 42 votes. 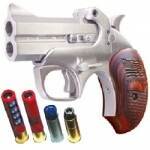 Summary: The description, specs, pricing, photo and user ratings for the DoubleTap Defense DoubleTap pistol. Rating: 4.5/10. From 31 votes. Rating: 4.4/10. From 48 votes. Summary: The description, specs, pricing, photos and user ratings for the Bond Arms USA Defender pistol. Rating: 5.0/10. From 59 votes. Rating: 3.8/10. From 29 votes. Rating: 4.0/10. From 39 votes. Rating: 3.7/10. From 6 votes. Rating: 3.7/10. From 26 votes. Rating: 3.2/10. From 6 votes. Rating: 5.5/10. From 15 votes.